Do you want to create a quick survey or feedback form? You can do this online without installing any software using Google Docs form builder. It allows you to make highly customized forms to include different type of elements, response types etc. You can embed and display final form anywhere or email it to recipients and see final consolidated responses at one place. 1. Goto http://docs.google.com & login using Gmail / Google Account. 2. Goto Create New > Form (a new window will open). 3. Enter title for the form in text box showing “Untitled Form”. Enter form description in text box below it (optional). 4. Now start adding questions and associated response elements. 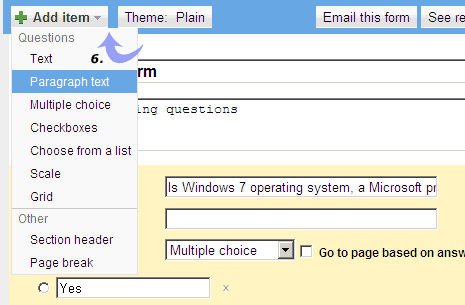 Type Question title text and select type of question from drop down menu among: text, paragraph, multiple choice, checkboxes etc. 5. Now enter text and options for answer fields of specific question. You can check option ‘make this a required option’ for answering specific question compulsory. 6. Click “Add Items” to add more different elements to the form. Click “Theme Plain” option to change look of the form by selecting a different theme. 7. 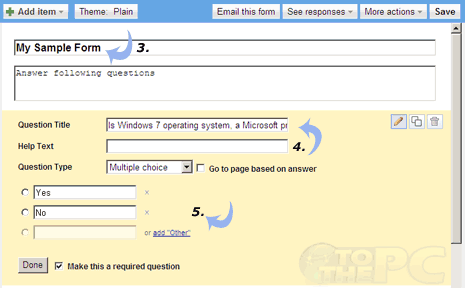 Once done with form building, click link at the bottom to preview form. You can enter dummy data and click “See Responses” button on form builder screen to see responses for the form. After the form creation you can forward to the form link to different users to gather responses. Alternatively, you can grab embed code to display form on website or blog for direct responses from visitors. 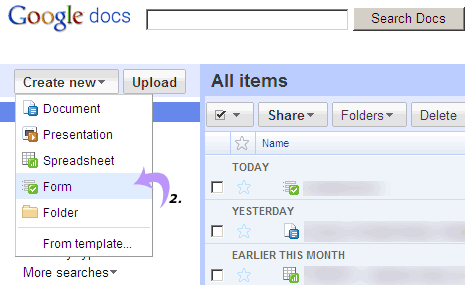 Simple, easy and its all free form creation process at Google Docs.